"Dark Satirical Postmodern Revisionist History"
THE FAVOURITE is a dark postmodern satire about two cousins in the court of Queen Anne of Great Britain and Ireland (circa 1702 to 1714), who vied for the attention of the Queen. Burdened with strong foul language and detestable content, THE FAVOURITE ultimately distorts history and makes Queen Anne appear more foolish and cruel than the historical record reportedly shows, although the ending of THE FAVOURITE does make a valid warning against the dangers of absolute power and the relentless pursuit of power for its own ends. THE FAVOURITE is a dark postmodern satire about two cousins in the court of Queen Anne of Great Britain and Ireland (circa 1702 to 1714), who vied for the attention of the Queen. THE FAVOURITE has a rather silly, self-righteous, postmodern sensibility about it that replaces purpose-driven causality for people’s actions with superficial modern psychological and even homosexual rationalizations. This ultimately distorts history and makes Queen Anne appear more foolish and cruel than the historical record reportedly shows, although the ending does make a valid warning against the dangers of absolute power and the pursuit of power for its own ends. The approach of the filmmakers seems rather ugly and mean when one examines it more deeply afterwards, though they try to rationalize their decisions in the movie’s production notes. Their explanations don’t quite make total sense, but they have some valid points about the problems many period movies have trying to cover historical subjects. THE FAVOURITE opens with a young Abigail Hill coming to the court of Queen Anne to serve as a maid. Abigail’s cousin is actually Sarah Churchill (an ancestor of both Winston Churchill and Princess Diana), who’s married to the Earl of Marlborough, the head of the Queen’s army, who’s just defeated the French on the battlefield. Lady Marlborough is actually Queen Anne’s childhood friend and is now her closest advisor. Sarah wants to add to her husband’s army so he can win a second victory and totally defeat the French. To do so, however, England will need to raise taxes once again on the landed gentry, who are represented by the opposition Tory Party headed by a mean but astute young politician named Harley. One night, Abigail manages to find out the secret to Sarah’s success with the Queen. She and Queen Anne are secret lesbian lovers! So, Abigail apparently decides to replace her cousin in the Queen’s lusty affections. She begins by poisoning her cousin’s tea before she goes riding. This leads to a terribly horse-riding accident that by chance leaves Sarah unconscious and debilitated in the countryside at a house of prostitution, until she’s able to summon her friend, the Prime Minister. The idea that Queen Anne engaged in lesbian trysts with Sarah Churchill and Abigail Hill is pure speculation, and the filmmakers even admit this in their movie’s production notes! If one wanted to be fair (and why not? ), one could say that the filmmakers intended to make a dark satire about Early 18th Century England, not a dull historical period piece. Consequently, THE FAVOURITE is filled with funny, satirical lines and behavior that’s entertaining, up to a point. The problem with this, however, is that, ultimately, THE FAVOURITE applies a strong humanist, almost Neo-Marxist, postmodern sentiment on its subject matter. The movie takes most of its portrayal of Queen Anne from the personal writings of Sarah Churchill, Lady Marlborough, which reportedly paint a very scathing, negative portrait of Queen Anne. In reality, Queen Anne probably wasn’t as weak as Sarah pictures her, and she was a devout, patriotic woman devoted to the Anglican Church, the Church of England in which she grew up, placed there by her Catholic father, no less! The movie doesn’t deal with the religious beliefs of its characters but gives them a modern political, psychological spin that depicts Queen Anne as becoming more and more autocratic. It also has a negative view of British society at the time, so THE FAVOURITE is partly feminist agitprop, viewing its three lead female characters as trapped in an oppressive time and place. However, you wouldn’t want to meet these three proto-feminists in a dark alley anywhere; you might find yourself stranded all alone, without your clothes and your wallet!!! That said, the movie’s final image strongly suggests that Lady Abigail has debased herself to gain favor with Queen Anne. By doing this, the movie also suggests that power tends to corrupt and power corrupts absolutely. This positive message, however, comes too little too late and doesn’t quite match the historical record of Queen Anne’s reign, which in historical retrospect seems more enlightened than others of its time period. So, THE FAVOURITE doesn’t appear as well-planned as the filmmakers might think it is. Whatever the case, though, THE FAVOURITE is too dark, treats history like a wax nose, and contains abhorrent, lewd content serving a postmodern humanist worldview that uses homosexual behavior to make jokes and political points. The movie also has a feminist outlook that sees three strong powerful women as trapped by the allegedly sexist, oppressive world in which they live. This is revisionist history meant to serve a postmodern leftist political ideology, not something to garner really insightful historical truths, facts, information, or lessons. Real history will always take into major consideration the movement of God and His Church on the affairs of men and women and treat people of the past as fairly and as justly as they deserve to be treated. Very strong miscellaneous immorality overall includes Queen gets angry at various moments for no rhyme or reason and yells shrilly at people to stop doing what they’re doing immediately, Queen becomes more demanding and autocratic as the story continues, political treachery, a couple scenes of gambling, woman says her father sold her to pay off his gambling debts when she was four, woman considers blackmailing her friend but thinks better against it and burns some incriminating letters, an accusation of theft may be false, a maid plays a couple cruel pranks against the new maid, there’s plenty of selfish intrigue at the royal court of Queen Anne of Great Britain and Ireland circa 1702 to 1714, woman tries to make friends with her cousin after doing her dirty, but the cousin refuses, some sexism but it’s placed in a strong feminist, politically correct, humanist context with revisionist homosexual history. 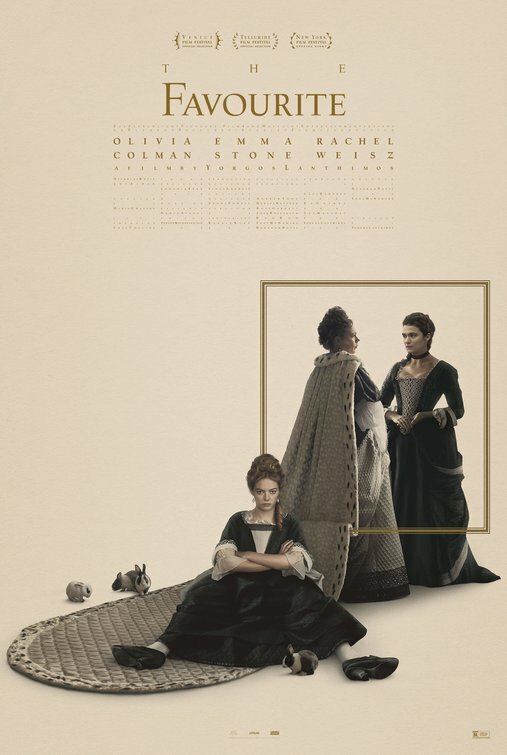 THE FAVOURITE is a dark postmodern satire about two cousins in the court of Queen Anne of Great Britain and Ireland (circa 1702 to 1714), who vied for the attention of the Queen. Sarah Churchill, aka Lady Marlborough, close friend and powerful advisor to Queen Anne, tries to stop her scheming cousin, Abigail Hill, from ingratiating her way into the Queen’s bedchamber. Abigail succeeded, but not for the reasons cited in this anachronistic, humanist, feminist, politically correct movie. The idea that Queen Anne engaged in lesbian trysts with Sarah Churchill and Abigail Hill is pure speculation, which the filmmakers admit in their movie’s production notes! Ultimately, THE FAVOURITE doesn’t succeed because it tries to add some serious, unconvincing, historically inaccurate political points to its free-wheeling satire. At one point, the Queen suddenly shows evidence of having had a stroke on her left side, but this situation comes out of the blue. Burdened with strong foul language and detestable content, THE FAVOURITE has a rather silly, self-righteous, postmodern, politically correct, abhorrent sensibility about these three powerful women and Early 18th Century England.